Does anyone else have the problem where you can never seem to find a night when everyone can be in the same town for the campaign? A few game nights slip by, and pretty soon everyone just gives up on it altogether? As a GM, I know how frustrating this can be (after so much work – guilt trip). Then, BOOM, it hit me. OK, it was actually the invite I got to join Google+ (the new Facebook style online site). Who needs a new Facebook, right? Well, aside from being cleaner and easier to use, Google+ has Hangout! “What is Hangout?” you ask. Well. It’s an online video chat feature for up to 8 people. Yay! Now, of course, this is difficult with D&D4 and its cards, etc. But, if you can get one or two players to help (there’s usually someone who can come over), you can run a campaign with people in different parts of the country. Out camping… tough! You better hope there’s not WiFi. Warhammer has proven to be difficult, but D&D4 is not nearly as bad. I’m now considering starting a campaign with my friend in Albuquerque, who I haven’t played D&D with since we were kids. That’s a pretty nice feature. When running a campaign, I implement an experience point bonus plan to encourage character development to encourage the “role” part of role-playing. The 4th edition rule set is highly flexible and friendly for DMs. One thing you can do to make it even easier on yourself is to not worry about whatever the book you’re looking in says the monster is. Instead, find creatures that have the powers you want, at the level you want, and just re-theme them. Need a ton of low-level minions for a bar fight? Use that silkworm from the Dark Sun book and just say that the triggered action on death is the guy puking rather than the worm bleeding acid. As most folks who’ve been involved in 4th edition would say, party balance is pretty easy because of the clearly defined roles that the character builds have. They’re right. What’s less easy is maximizing that cohesiveness if you’re looking to make everyone work at peak performance with everyone else. A defender isn’t always the best choice if you want to keep getting combat advantage for your rogue, clerics may have the most healing options, but that doesn’t mean they’ll be the best healer for your party, and strikers can be brutal, but does your one hit wonder work well enough to be an asset and not a liability once they’re spent? The key is to not only understanding how your character’s powers and abilities work together, but understanding how the powers and abilities of everyone else works with them as well. The Essentials build Sentinel (Druid) is an awesome pick for getting that rogue his CA all the time, but there are wizard and cleric builds that work better with a ranged rogue. If you’re looking to make things work together as tightly as possible, knowing how the characters powers help each other is the key. At the end of a session, we have two awards that we assign to players based on their role-playing for the evening, MVP-Players’ Choice and MVP DM’s Choice A 10% experience point bonus is awarded for each. The group votes and the DM chooses a player that they consider to have added to the experience the most for the evening. This could be from role-playing a particularly challenging scene, solving a difficult problem, staying within character despite bad consequences or simply creating a situtaion that helped everyone’s entertainment level. This system really encourages players to add to the experience and not simply bumble through encounters trying to kill everything. Too often players will be afraid to use daily and encounter powers early on in an encounter. Where this can really get folks into trouble is that it’s not the strength of what’s attacking you that you have to worry about the most, it’s how many times you’ll be attacked. Let your AOE guys go nuts early on once you find pockets of minions, have your strikers take out the ranged guys, and get your defenders out there to make safe passage for everyone to get to where they need to be. Your encounter powers make this much more efficient and you’ll take less damage overall during the encounter. It’s also very important to know exactly what your powers do. Too often I’ve watched healers kick off their daily powers when the party’s chips have looked way down and it usually does just enough to get them to come out on top. But if those folks had actually read their powers, they’d have known that most healer based daily powers are most effective near the start of an encounter, not at the end. They usually pump your healing ability and that is pretty much worthless at the end of an encounter because your healing stuff will all be used up by then. Stop being afraid to stomp monsters at the beginning! You may not want the whole party using their daily’s first round, but it sure as heck is sad to risk a TPK with daily and encounter powers unused. We have each player select one Bond from the two lists related to two other characters. Whenever players resolve a Bond (this happens when both players agree the issue is resolved) I award them bonus XP. This really helps people roleplay and stay in character. The way that D&D 4e has evolved has wound up consolidation all of the latest character (race, class, etc.) rules and monster stats into D&D Insider, a suite of online tools available for at most $10 per month. A subscription to this give you access to a character builder that allows you to make anything from the previous books. 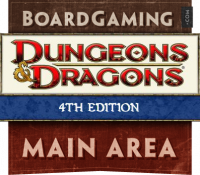 It also includes access to all past articles from Dragon and Dungeon, giving you plenty of adventure modules to run right away. For the rules of the game, players and DM’s can find everything else they need in the Rules Compendium, another more recent release which combines rules from the Player Handbooks and Dungeon Master Guides into an easy to read format. This book and the subscription above can get you and a DM everything you need to play with the newest rules for about $30. Aspiring Dungeon Masters might want to continue to pick up the Monster Vault, which comes with a huge set of Monster Tokens and classic D&D monsters, and possibly a Campaign Setting if fleshing out the world themselves is too much work. That’s really all you need to get started these days, and with the rules as simple as they are, it’s a great time to begin D&D! With 4ed being as combat focused as it is, player characters need to evolve and develop sound strategies to stay alive in high level situations. As tempting as it is for some people to start playing for the first time as an Epic level character, with a myriad of powers and magic equipment, it makes it hard to realize what benefits and tactics all those shiny cards really bring to the table. A character that works his way up from the beginning knows his strengths and limitations, knows what edges his equipment gives him, and will be a better overall character. Flanking is when you and your comrade are on opposite squares from each other on either side of the monster. It is one of the most important tactics to remember, whenever you can get a +2 to your attack roles, that’s a huge plus. So always remember to use your shift ability to get into a superior tactile advantage, namely flanking! One mistake I’ve seen in groups is that they often all want to be the ‘boss killer’, or the all want to be ‘the fireball thrower’. Both definitely have their place, but when choosing your class/abilities/spells, be sure to keep in mind what your group is already good at, and what they need. Going into an encounter with no way to deal with bosses with high defenses, or large numbers of moderately powerful enemies, is the easiest way to lose. So let’s be realistic for a moment. 4th Edition is very structured in the way it does combat. Unfortunately, some players will take a long time on their combat turn (especially the DM). So how does one prevent from being so distracted that they begin taking the entire group focus away from the game? My advice is to have the Player’s Manual always handy. This isn’t for rule checking, but as a tool from entertainment. My players love investigating what abilities they’ll have to choose from, reading about equipment, and learning about mounts while waiting for their turn. This way, they are still playing DnD even when it isn’t their turn. After a few months of weekly play our group decided its not worth keeping track of xp as there is enough we all need to focus on during a session. Instead we chose a regular interval, every 2 or 3 sessions in which we would level up. So far it works great, and I don’t think i could ever go back. Although it may hurt your pride, never forget that running for it is often an option, and sometimes the best choice when things begin looking bleak.